May is “National Bike Month” and Friday, May 18 is National Bike To Work Day in 2007. In Colorado, the Colorado Legislature has designated the month of June as Colorado Bike Month, and Colorado Bike to Work Day is Wednesday, June 27. 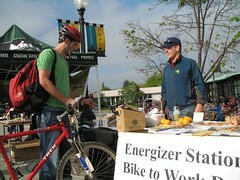 If you haven’t started already, plan now for Bike to Work Day events at your job and in your community. See what your local bike clubs, regional transportation commissions and employee wellness groups are doing to promote Bike to Work Day. If they’re not planning anything, jump in and get something organized yourself! Watch this space for ideas and resources to promote commuting during National Bike Month.